The Director, General Services of the Volta River Authority, Miss Shirley Habiba Seidu, on behalf of the Management of the Volta River Authority (VRA), has donated a solar-powered mechanized borehole facility to the people of Amlalokorpe, Klukorpe and Afagbokorpe in the Togorme Traditional Area. Handing over the facility to the community, Miss Shirley Habiba Seidu stated that “the provision of the water facility affirms the Authority's commitment in providing support to riverine communities that have been negatively affected by the construction and operation of the Authority's hydro dams at Akosombo and Akuse." She reiterated VRA's commitment in fighting the bilharzia and schistosomiasis menace in the riverine communities through holistic interventions such as the provision of water facilities, community sensitization as well as collaborating effectively with the Ministry of Health in the adminisration of mass drugs to alleviate the plight of the residents. District Chief Executive of the North Tongu District Assembly, Mr. Richard Collins Arku, received the water facility on behalf of the three communities and commended the Authority and Project Maji for gratifying their needs. 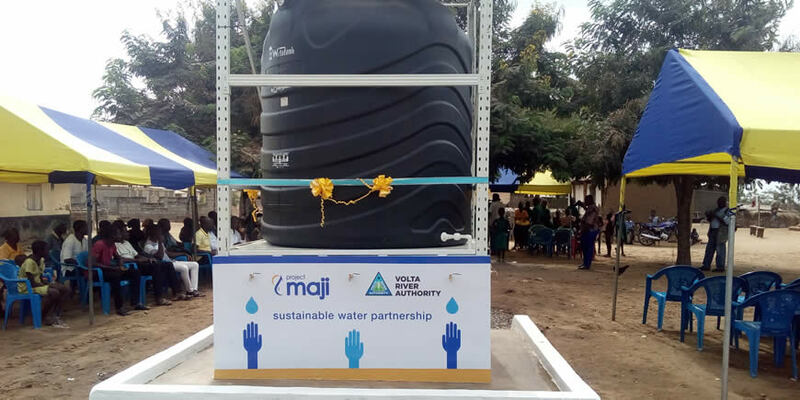 The solar-powered borehole facility which has been located at Amlalokorpe was executed by Project Maji, the Corporate Social Responsibility (CSR) subsidiary of Binatone. At the event were Director ESD, Mr. Eugene Asomontsi, Manager CSR, Mr. Sam Fletcher and other Management and Staff of the VRA, Managing Director, Project Maji Foundation, Mr. Babu Venu, Ag. Chief of Torgome and Head of the Amlalokorpe community.